I liked how close this hotel is to downtown Lansing. The indoor pool set up was unique and charming. the building was obviously older and dated but was kept clean and beds were comfortable. things seem to be in good working order all around. Continental breakfast was typical but good! Where to find Lansing hotels near an airport? Where can I find hotels in Lansing that are near tourist attractions? If you would like to visit Southwest Michigan and want to book either an affordable or upscale hotel or apartment in Lansing, you'll find plenty of accommodation choices with Expedia. Lansing has around 18 hotels within easy driving distance of the heart of town. 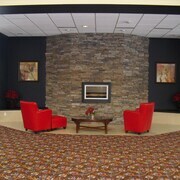 Those looking for accommodation close to the center of Lansing should look no further than the Radisson Hotel Lansing. The hotel neighborhood of East Lansing, a popular hotel area in Lansing, has 6 hotel establishments. East Lansing is 6 kilometres (4 miles) from the center of Lansing and is one of the most popular hotel districts. In East Lansing, the Marriott East Lansing at University Place and Towneplace Suites by Marriott East Lansing are some popular options. An alternative hotel district is Okemos , approximately 13 kilometres (8 miles) from downtown. 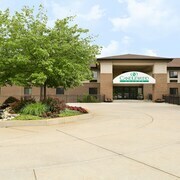 Okemos has 5 hotels, including the Staybridge Suites Lansing - Okemos and Hampton Inn & Suites East Lansing Okemos. Charlotte, Dewitt and Dimondale also have Lansing hotels that are bookable through Expedia's database. If you hope to reserve a room in Charlotte, choose from between the Holiday Inn Express Hotel & Suites Charlotte and Comfort Inn Charlotte. Alternatively, Dewitt's hotels include the Sleep Inn Lansing North/Dewitt and American Inn & Suites. 13 kilometres (8 miles) from the middle of Lansing, Dimondale has a selection of hotels including the Holiday Inn Express Hotel & Suites Lansing-Dimondale and Comfort Inn & Suites Diamondale – Lansing. For somewhere to stay that is located close to the Michigan State University, you could look at the Candlewood Suites East Lansing or the Quality Inn University. 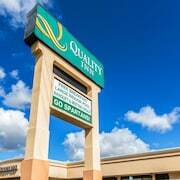 The Candlewood Suites East Lansing is 3 kilometres (2 miles) away and the Quality Inn University is 3 kilometres (2 miles) away. Budget travelers rejoice! 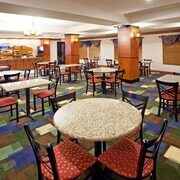 Lansing provides a fine selection of economical hotel options. 10 kilometres (6 miles) from Lansing's center is where you'll find the Sleep Inn Lansing North/Dewitt. The American Inn and Suites Ionia is just 50 kilometres (31 miles) away. The Comfort Inn Charlotte and the American Heritage Inn are amongst the other budget accommodations worth checking out. The Radisson Hotel Lansing is 0.1 kilometres (0.1 miles) away from the middle of Lansing. Another alternative is the Hampton Inn & Suites Lansing West, which is located 9 kilometres (6 miles) away. If you'd prefer, you could book a bed at the Hampton Inn East Lansing or the Crowne Plaza Lansing West. While you are in Lansing, take the time to enjoy Southwest Michigan's other attractions. Investigate Southwest Michigan's art galleries. Those who love nature can also make the time to enjoy its forests and lakes. Active visitors may try their hand at cycling, shore fishing and winery tours here. 100 kilometres (61 miles) from Lansing is Kalamazoo, home to the Western Michigan University and Kalamazoo College. The Radisson Plaza Hotel at Kalamazoo Center and Kara's Kottages are some of the Expedia-listed hotel and apartment alternatives in Kalamazoo. Alternatively, you could stay in Heartside District, 95 kilometres (59 miles) to the west of Lansing, where you can pick from the JW Marriott Hotel Grand Rapids and Courtyard by Marriott Downtown Grand Rapids. While in Heartside District, a couple of sights worth adding to your itinerary are the Urban Institute for Contemporary Arts and Spectrum Theatre. Searchfor our current Lansing travel listings and explore the great things to experience that that this part of the world has in store. What are the most popular Lansing hotels? Are there hotels in other cities near Lansing? What other types of accommodations are available in Lansing? Explore Lansing with Expedia.ca’s Travel Guides to find the best flights, cars, holiday packages and more!